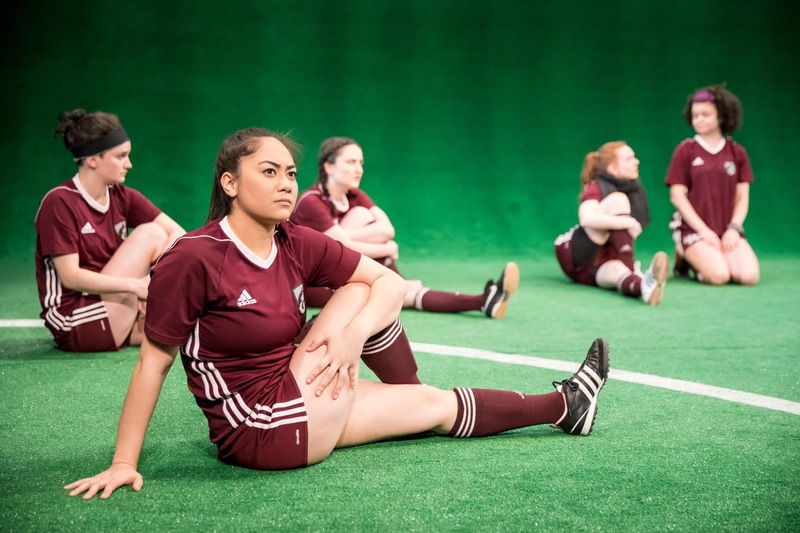 The Jungle Theater's production of playwright Sarah DeLappe's story of a girls' soccer team, The Wolves (a finalist for the 2017 Pulitzer Prize), was so successful that they've brought it back in a new venue. With The Children continuing on the Jungle's stage, this is the first time in their history that the Jungle has had two shows running simultaneously. I attended the first preview on a night when the temperature was 20 below zero, not to mention the windchill, and it was a nearly full house. This play has really struck a chord, both with audiences and with the cast and creative team, all of whom return this year. It's such a beautiful and real exploration of nine very different young women, their lives, and their friendship - just the kind of story we're craving right now. That these nine young and talented actors (the Twin Cities Theater Bloggers favorite dramatic ensemble of 2018) have the opportunity to play these complex and interesting roles that go beyond the usual stereotypes of teenage girls we see in plays/movies/TV, beyond the wife/girlfriend/mother role, is also a reason to celebrate. If you missed one of the best #TCTheater performances of 2018, now's your chance to get in on the action (click here for info on the show and complementary programs on women and sports). 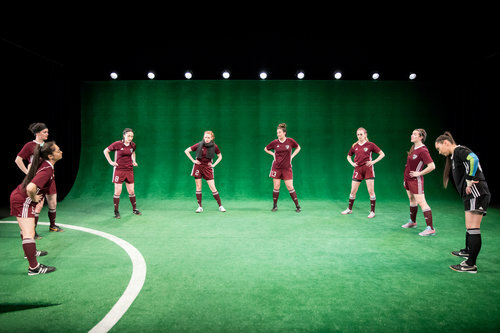 The entire play takes place at pre-game soccer practices over a few weeks. Nine high school girls (played by Becca Hart, Chloe Armao, Isabella Star LaBlanc, McKenna Kelly-Eiding, Megan Burns, Meredith Casey, Michelle de Joya, Rosey Lowe, and Shelby Rose Richardson) gather to stretch, talk, and tease each other. Topics range from parties, boys, and TV shows to the Khmer Rouge, pregnancy scares, and the death of a parent. The girls represent a wide spectrum of interests and personalities, but they all come together to play this game that some of them have been playing together almost their whole lives. Not much happens, until something big happens, and suddenly things get real serious. Each one of these characters could have their own spin-off series on Netflix. Each is a fully defined character, so beautifully and specifically played by the cast, but not everything in their lives is spelled out for us. We see hints of depth and further life in each of them, but we only have a short time with them so we don't get it all. DeLappe has written the play and the characters in a way that it feels like they all have full and complex lives outside of the scope of these particular scenes. To be a teenage girl is a difficult thing, especially now. This play beautifully captures that balance of striving toward adulthood, but still being kids who think making faces with orange peels is hilarious. The story plays out on a simple set that's just a sloped floor covered with turf. 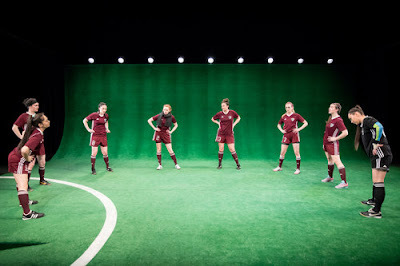 The girls are dressed in their soccer uniforms for most of the show, but with slight variations that help define character (costume and scenic design by Sarah Bahr). And they actually play soccer, going through workouts and running across the stage while talking, acting, emoting. Every woman in this ensemble gives a wonderfully nuanced performance (also including Jennifer Blagen, who is asked to do some heavy lifting as a soccer mom, and delivers). The Jungle's stage is a small jewel box of a space, much different from the Southern's grand arch, cavernous space, and steeper pitch in the audience. Although it's still an intimate story, it feels bigger in this space somehow, and actually more like the soccer dome where the play takes place. You're viewing the stage from above and at a little more distance, perhaps close to how the spectators at the Wolves' games experience it. The Southern Theater has never looked less like the Southern Theater, with the iconic arch and historic walls completely covered in black curtains surrounding the sloped green turf. At times I forgot where I was, so thorough is the transformation from historic old theater to modern sports dome. Your second chance at The Wolves continues through February 17. As I said last year, "Recommended for people who do or don't like sports, who have or have not ever been a teenage girl." These (fictional but very relevant) girls' voices, stories, experiences deserve to be heard and seen by everyone.